Capello Resigns Part Le Deux !!!! With a nice little summer break coming up, Holloway and the lads can take a couple of weeks off before their first game in the WC qualifiers against Montenegro. Re: Capello Resigns Part Le Deux !!!! Holloway gets to experiment against Japan and Slovakia. With Jordan Henderson stepping into a pivotal role in midfield things have heated up for places in the squad. With the depth available to him now, Holloway will have some very tough decisions to make. Jack Wilshere had been overlooked once again for these two games and has fallen out of favour at Arsenal without making an appearance for them yet this season. Many speculate that he will be leaving Arsenal in order to gain first team football. Jack Rodwell seems to have cemented his place into the squad with a string of impressive performances for club and country. 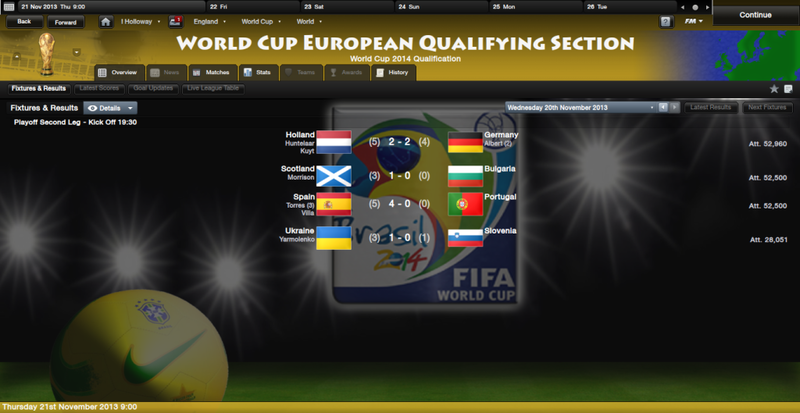 Joining England at the World Cup will be Scotland who overpowered Bulgaria in the play offs. Its time for the World Cup Drawing !!! England are drawn in the first pot which means they will miss the top seeds but could still face the likes of the USA in the group stage. Oh my, England certainly have done it again. 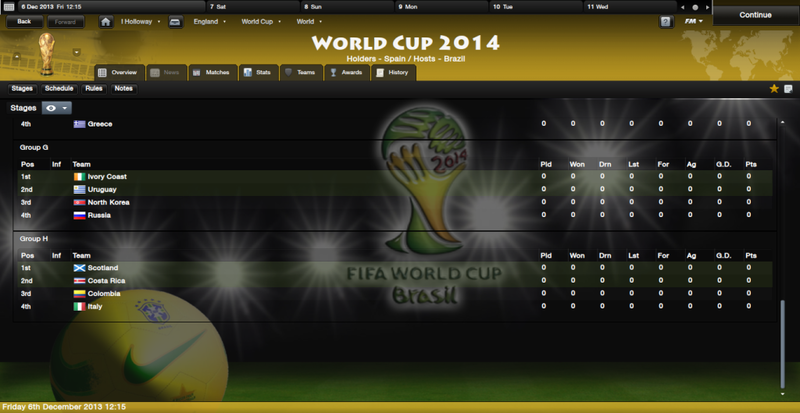 Hoping to avoid the USA but it didn't work out that way and they have a surprisingly tough group. Greece have been on form and are on a 16 game unbeaten streak at the moment. Morocco lost to England in the Confederations Cup and will be looking to avenge that defeat. USA had a difficult time qualifying and almost missed out. It took a last minute goal by Freddy Adu against UAE in a play off for them to qualify. 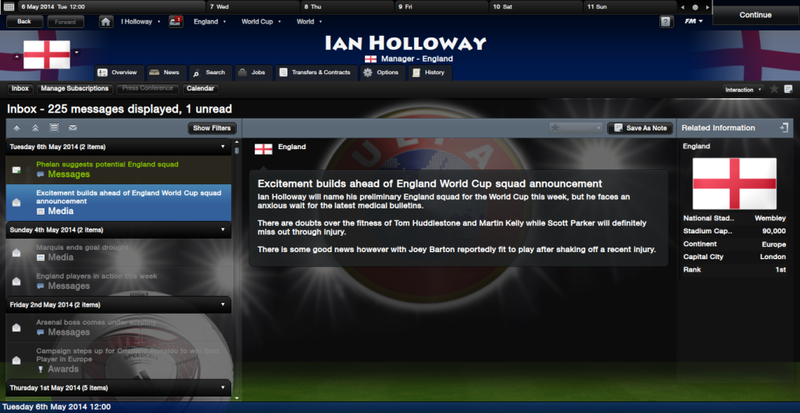 England will still be very nervous about playing them though. Heading into January and some major injury concerns at club level may have repercussions on the National team so Holloway is busy arranging some friendlies just to be prepared. Martin Kelly is out of 3-4 months with a damaged achilles tendon. Theo Walcott is out for 6 weeks with a Hernia. Micah Richards has fallen out of favour at Man City and has only 4 games to his name this season for them. Steven Gerrard cannot get a starting place at Liverpool, has only come on as a sub 4 times this season. Adam Johnson, now at Stoke is out for 3 months with a broken ankle. Peter Crouch is out for 3 months with a fractured hip. Joe Hart has been having a torrid time lately and seems to have lost his starting spot at Man City to Fraser Forster. Ashley Cole seems content to sit on the bench for Chelsea. Gareth Barry has been transfer listed by Man City and hasn't played for them since August. Joleon Lescott seems to spend most of his days on the bench at Man City as well. While there is plenty of time for these players to recover etc, there will be concerns about match fitness. On the other hand, Daniel Sturridge is setting the EPL alight with goals, with his transfer to Newcastle he has seemed to kick it up a notch and has made Holloway sit up and pay attention. Ben Watson at QPR has been having a great season in midfield and is certainly pushing for a spot in the squad, not a youngster at 28 years old but has slowly built himself up and is quite a force in the EPL these days. Shaun Wright-Philips is also having a stellar season at QPR. 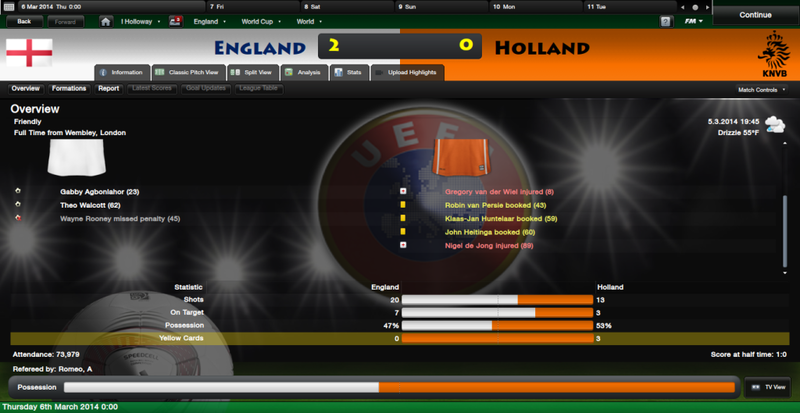 England shine and outclass Holland. But some bad news has really hit the England team hard with Scott Parker breaking a leg in a club game, and will not return this season and will not feature in the World Cup in Brazil. Also out for the season is Martin Kelly with a fractured hip. 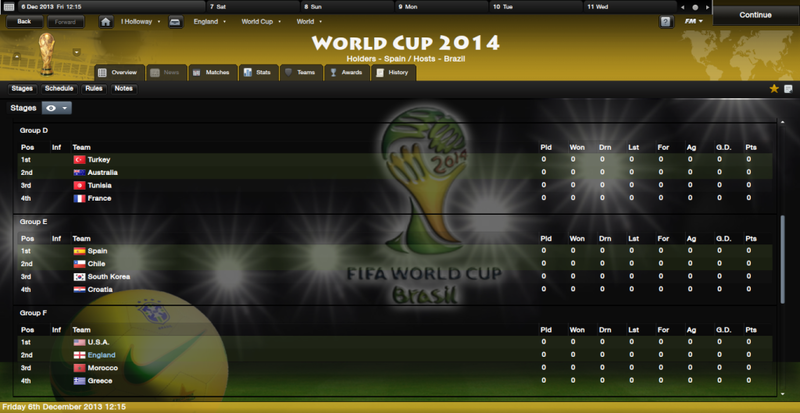 That WC draw is interesting. You should get through that group, though. And Gabon in the WC?????? Holloway names his preliminary 30 man squad for the World Cup. 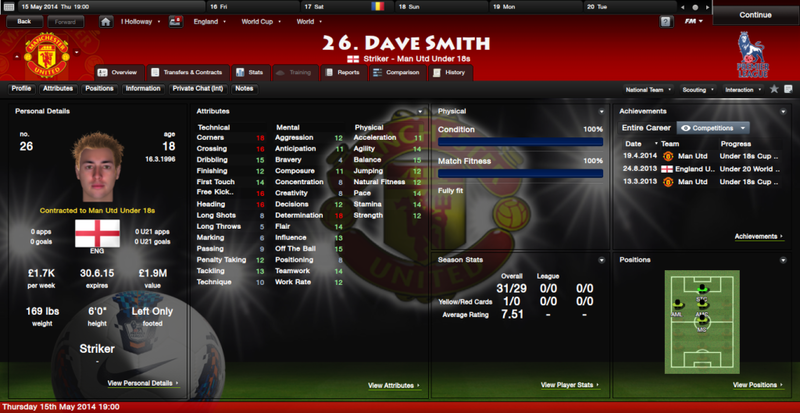 A big surprise was the inclusion of Dave Smith, the Man Utd youth player, who many feel is not ready for the step up into primetime. But 19 goals in 13 games has really caught Holloway's eye and we are sure we will see him in the friendlies leading up to the World Cup. With several players still trying to gain match fitness Holloway has been forced to arrange some friendlies to get his players fit. Games scheduled against Israel, Honduras and Ivory Coast. 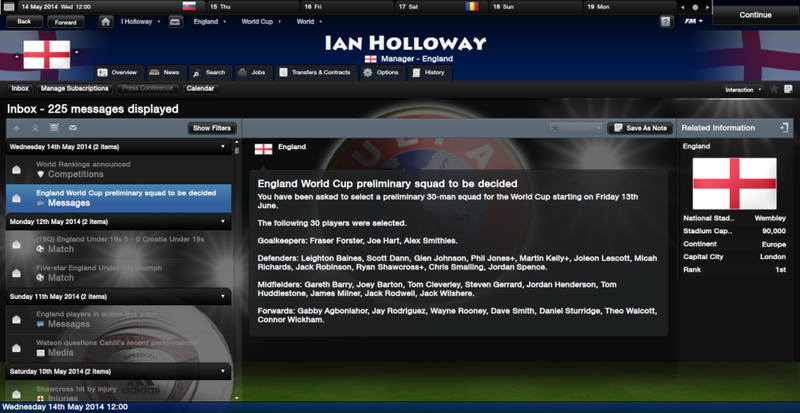 Will Holloway leave England after the World Cup? 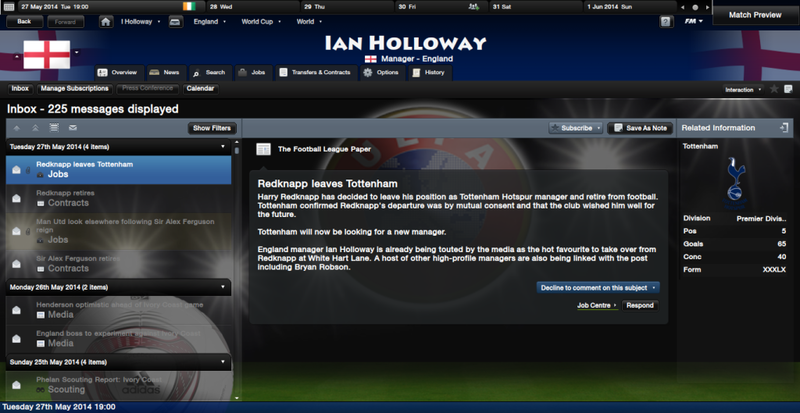 Two high profile teams are looking at Holloway to take over the reigns. 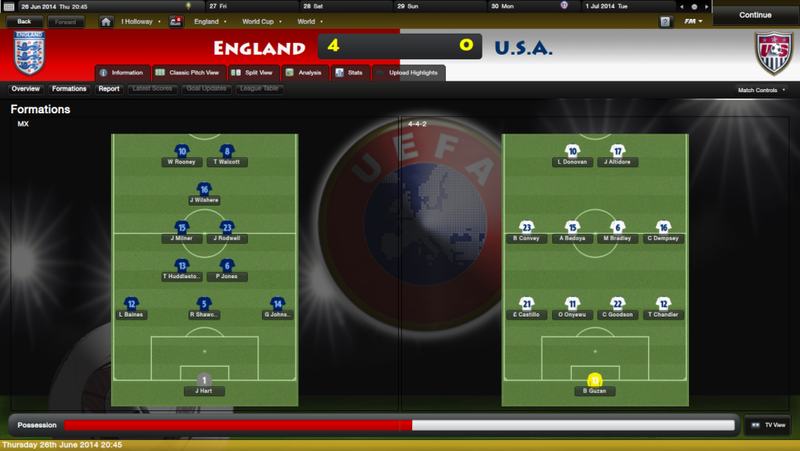 After much anticipation the World Cup campaign kicks off with England turning on the style against an abysmal USA side. Ollie's tactics clearly paying off with England controlling the midfield section of the park leaving USA with little options. Ryan Shawcross with a tremendous display picks up the MoM award. To say that Ollie is as chuffed as a badger is an understatement. 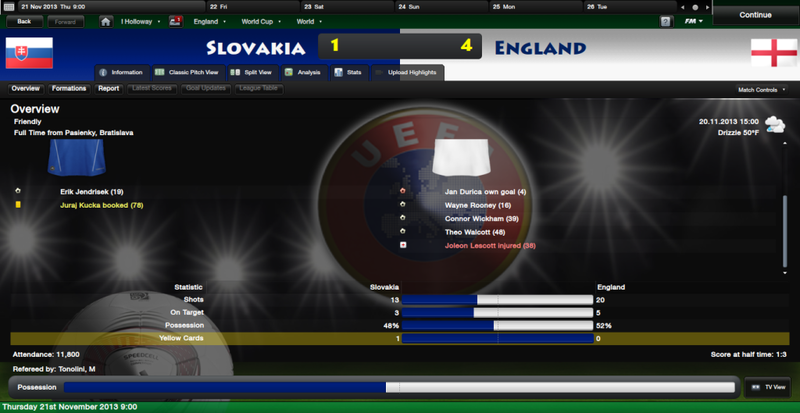 England really are tearing up the group. 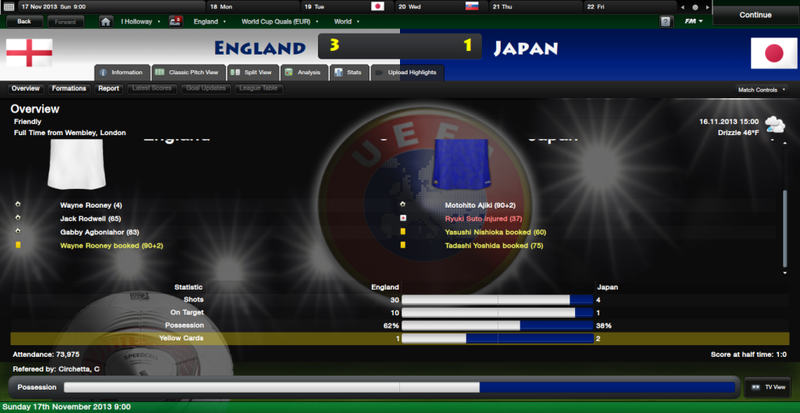 Ollie the master of tactics switches it up to a good old fashioned 4-4-2 and takes the Greeks by surprise. No prizes for guessing the MoM again? Its Ryan Shawcross who completes his second MoM award by grabbing a goal with a smashing header that rifles in off the underside of the bar. Looks like just a formality now in the match against Morocco to advance to the second round. 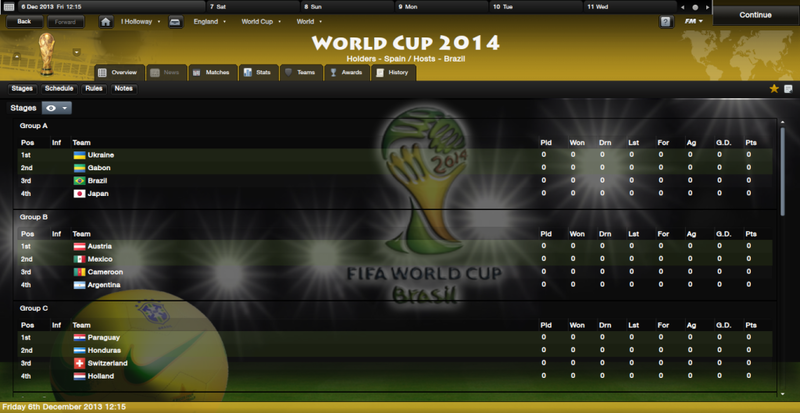 With losses for Spain, Brazil and Holland in their respective groups this World Cup could be thrown wide open. Good result again dude, you really are tearing it up! 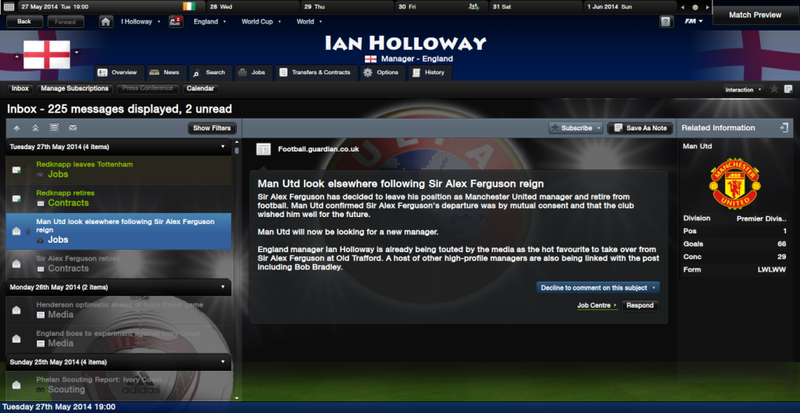 The FA really should've hired you for the Euro's, England might've won it then ! It would have been a very different squad than Woy's !!! Great results there man, hammering through the groups like Donkey Kong! Hopefully this'll be a great year for "Off the Trolley Olley! With great ease, England advance to the next stage with a thumping win over Morocco. Ollie is being hailed as "The greatest thing since Marmite" and just like Marmite you either love him or hate him. Nice easy win there against Morocco!